I often get the question what my favourite place in Barcelona is. It’s a tough one, there are so many great places. But often the first thing that comes to mind is Park Ciutadella. The park is like my back yard, so I go there often. Especially in the weekends it is a great place to spend some hours in the fresh air. There are several playgrounds for kids, a big fountain and a little boat lake. At the bottom of the park there’s the zoo entrance, a good option if you are visiting with young kids! But the thing I absolutely love about it is that there is never a dull moment. The park is packed with colourful people and the result is it looks like a true circus. 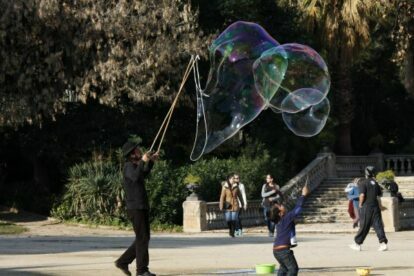 Acro-yoga, ropemanship, African drummers, Spanish guitar players or bubble makers to entertain the kids; every corner of the park has a view and an ‘artist’ to enjoy. I can spend hours just looking or listening if I’ve found a good spot. Located right next to the Born neighbourhood, I would advise you to pick up some picnic take-out food, bring some drinks and find yourself a nice spot on the grass. If not for the many things to see there, you will probably love it for simply relaxing in the sun in the less hot seasons or the welcome shade during a hot summer.